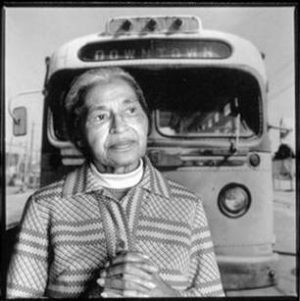 Home > Jazz News > CJO Pays Tribute to Rosa Parks in "Suite Rosa"
CJO Pays Tribute to Rosa Parks in "Suite Rosa"
Under the direction of Byron Stripling, the Columbus Jazz Orchestra (CJO) is proud to celebrate the courage, dignity, and legacy of “the mother of the modern Civil Rights Movement,” Rosa Parks in “Suite Rosa” (January 25-26, 2013 at the Lincoln Theatre). In connection with the 100th anniversary of her birth, this multidisciplinary concert will recall the day in 1955 when Rosa Parks courageously refused to give up her seat on the bus, and, through modern and historical music and dance, celebrate the African-American story. Single tickets are on sale now for $40 (loge)/$35 (orchestra) and available through the CAPA Ticket Office at 614-469-0939 and through all Ticketmaster outlets. Student and group rates are also available. For more information call 614-294-5200 or visit www.jazzartsgroup.org. Grammy-winning bassist/composer/conductor, John Clayton’s talents are consistently requested by the movers and shakers in the jazz industry, such as Quincy Jones and Tommy Lipuma. Clayton says, “When composing or arranging for the Clayton-Hamilton Jazz Orchestra, I am a disciple of Duke Ellington, Thad Jones, Oliver Nelson, Quincy Jones and Gil Evans, to name just a few.” Regarding his bowing techniques, he cites the radically different techniques of Slam Stewart, Major Holley and Paul Chambers as influences. There is no doubt, however, that John has created a niche for himself wherein he stands alone. As a testament to his immense talent and broad ranging appeal, John Clayton served as the Artistic Director of Jazz for the Los Angeles Philharmonic from 1999 through 2001. In addition, he is Artistic Director for the Centrum Jazz Workshop in Port Townsend, Washington and was also appointed Artistic Director for the Lionel Hampton International Jazz Festival in 2006. John has written and arranged music for Diana Krall, DeeDee Bridgewater (including her Grammy award-winning CD Dear Ella), Natalie Cole, Milt Jackson, Nancy Wilson, Quincy Jones, George Benson, Dr. John, Gladys Knight, Regina Carter, Queen Latifah and many others. He has been commissioned by many ensembles, including the Northwest Chamber Orchestra, the American Jazz Philharmonic, The Iceland Symphony, The Metropole Orchestra, The Carnegie Hall Big Band, The Richmond Symphony, the WDR Orchestra, and the Amsterdam Philharmonic. On the other hand, John was awarded a platinum record for his stirring arrangement of “The Star-Spangled Banner” performed by Whitney Houston during the Super Bowl in 1990. He has won numerous awards such as the Golden Feather Award given to him by the legendary Leonard Feather and the Los Angeles Jazz Society’s Composer/Arranger award. John has served as the musical director of several jazz festivals including the Sarasota Jazz Festival and the Santa Fe Jazz Party. As Artistic Director of the Vail Jazz Workshop, he participates in choosing talented students from across the nation in an intensive week of learning jazz. Last year, he was also appointed as Artistic Director for the Lionel Hampton International Jazz Festival. Clayton’s serious study of the double bass began at age 16 when he studied with famed bassist, Ray Brown. At age 19, John was the bassist for Henry Mancini’s television series The Mancini Generation. Later he completed his studies at Indiana University in 1975, graduating with a Bachelor of Music in Double Bass. Touring with Monty Alexander and the Count Basie Orchestra followed. He held the principal bass position in the Amsterdam Philharmonic Orchestra for more than five years. In an effort to sum up John Clayton’s unique expertise, “the man just does it all.” He is equally comfortable in jazz and classical music, and hits the mark, whether it is as composer, arranger, conductor, teacher, in addition to his magnificence when he plays his bass. Alexis Wilson was born in The Netherlands to a Dutch ballerina and an African-American award-winning Broadway choreographer and director. Although her first language was Dutch, she was raised and educated in the U.S. growing up in Boston and New York City. During her pre-teens her parents divorced and she and her younger brother moved from Boston to Manhattan to live with their father, Billy Wilson. Growing up with her father was an exciting upbringing spent at auditions, in rehearsal rooms and running around backstage while he worked on show after show and ballet after ballet. At eleven years old Alexis began to study classical ballet seriously at The New York School of Ballet, run by Richard Thomas Sr. and his wife Barbara Fallis. Alexis was the youngest member, performing with their small company (The U.S. Terpsichore) in their rendition of Giselle. At the age of fourteen, with strong encouragement from her late godfather Karel Shook (co-founder of The Dance Theatre of Harlem together with Arthur Mitchell), she joined DTH as an apprentice performing in the ballets The Four Temperaments, Serenade, Swan Lake and Dougla. Still in her late teens, Alexis made the transition from professional classical dancer to pursuing work in the commercial theater. She did numerous television commercials, performed in Emmy award-winning projects and TV specials. In addition to her father, Alexis worked with award winning choreographers from Michael Peters to Geoffrey Holder, as well as danced in The Cotton Club film directed by Francis Ford Coppola. In 1985, she attended Carnegie-Mellon University where she received her BFA in drama. Alexis has been a featured dancer in musicals both in U.S. national tours as well as in Europe. Upon her return to the States and after the death of her beloved father, she began a life away from performing. She began working as a casting associate to Peter Wise of Wise & Assoc., casting national commercials and theater productions including Twist and Broadway’s smash hit Smokey Joe’s Café. As executrix of her father’s estate, Alexis continues to keep one foot in the dance and theater world. However, it is her passion for writing that has led her to her greatest creative inspiration including her most recent work, a memoir titled Not So Black and White. Alexis is excited to be currently writing and preparing to perform her own one woman show Not So Black and White for New York audiences, followed by work on adapting the story to screenplay.